Thornton Rust is a village and civil parish in the Richmondshire district of North Yorkshire, England. It lies in the Yorkshire Dales about 2 miles west of Aysgarth, high on the south bank of the Ure in Wensleydale. The village is mentioned in the Domesday Book by the name Toreton. At the time of the Norman invasion the manor belonged to Thor, but afterwards was granted to Count Alan of Brittany. A mesne lordship was held here by Sybil of Thornton in 1286, but the head tenant of the manor was Robert de Tateshall, who was also lord of Thorlaby manor. The descent of Thornton Rust manor followed that of Thoralby into the 19th century. The topynomy of the village name is derived from the combination of the Old English words of þorn and tūn, which gave the meaning of Thorn tree farm, and partly from St. Restitutus, the patron saint of the medieval chapel erected here. The chapel no longer exists. The village lies within the Richmond UK Parliament constituency. 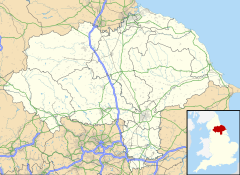 It also lies within the Upper Dales electoral division of North Yorkshire County Council and the Addlebrough ward of Richmondshire District Council. The civil parish shares a grouped parish council with the civil parishes of Aysgarth, Bishopdale, Newbiggin and Thoralby, known as Aysgarth & District Parish Council. The village is at an elevation of 870 feet (270 m) at its highest. The River Ure and the A684 are 0.5 miles (0.80 km) to the north. The village of Aysgarth is 2.5 miles (4.0 km) to the south east and Bainbridge 2.6 miles (4.2 km) to the north west. It is a typical linear village on top of a limestone scar. The 2001 UK census showed that the population was split 50% male to 50% female. The religious constituency was made of 78.4% Christian and the rest stating no religion or not stating at all. The ethnic make-up was 97.7% White British and 2.3% White other. There were 57 dwellings. The 2011 UK census showed that the population was split 51.4% male to 48.6% female. The religious constituency was made of 78.5% Christian and the rest stating no religion or not stating at all. The ethnic make-up was 98.1% White British and 1.9% each White Other . There were 63 dwellings. The village has a bus service which is operated by the Little White Bus and goes between Hawes and Leyburn. More Services can be reached from the nearby villages of Aysgarth and Worton. ^ Thornton Rust in the Domesday Book. Retrieved 6 April 2013. ^ a b "History". Retrieved 6 April 2013. ^ Bulmer's Topography, History and Directory (Private and Commercial) of North Yorkshire 1890. S&N Publishing. 1890. p. 346. ISBN 1-86150-299-0. ^ Watts (2011). Cambridge Dictionary of English Place-names. Cambridge University Press. p. 611. ISBN 978-0521168557. ^ "Parish and Town Councils". Richmondshire District Council. 2014. Archived from the original on 19 August 2014. Retrieved 18 August 2014. ^ "Population at Cenuses". Vision of Britain. 2009. Retrieved 6 April 2013. ^ a b "2001 UK Census". Office for National Statistics. 2002. Retrieved 6 April 2013. ^ a b "2011 UK Census". Office for National Statistics. 2013. Retrieved 6 April 2013. This page was last edited on 9 February 2019, at 12:33 (UTC).